Live a Colorful Life: Peace! A year and a half ago, I met Rene' for the first time. It was at a quilting retreat in Minnesota, just a small group, ten of us. I remember Rene' sewing lots of pinwheels. Lots of pinwheels. Well guess what? She has just released her first pattern! I was part of the lucky group who got to help pattern test. I made the baby size and I can hardly wait to show it. 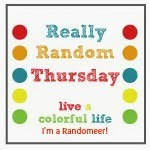 The blog hop started today. At each stop you will get to see a different version of Rene's pattern, which comes in three sizes, and get a chance to win the pattern. 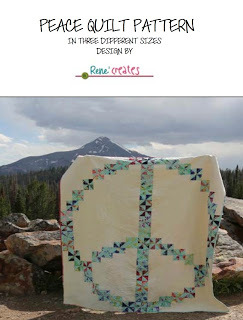 It's one of those wonderful quilts that is easy to put together AND yields stunning results. 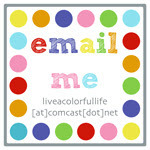 Wednesday, January 23 - Cindy at Live a Colorful Life (http://aroundtheblockdesigns.blogspot.com) ME! Ohhh! yummy colour choice! It reminds me of a sunny, Summer day! Of course I can't wait to see your version of Peace! I love Rene's photo in the mountains! Great teaser photo with all those yummy solids! Can't wait to see the final reveal. How did I forget that I was piecing all those pinwheels at Gruber's?! Can't wait to see your version! I'm so happy for Rene'!